Long ago (about 15 years), I found my perfect plain white T-shirt in the bargain bin of a posh London shop. It was, without doubt, my favourite and most flattering white T shirt ever. It was made from a pretty thin jersey though, so barely lasted more than two summers. The thing that made it different to other T-shirts was its neckline. It had an overlapping section on either side of the neck, that joined to the shoulder seams. I've since discovered that this shrug style detail is seen a lot in 1940's fashions. And babies vests of course! Imagine my delight when Jennifer Lauren released her second pattern - the Bronte Top - featuring this very shoulder detail. Jen kindly sent me the PDF pattern to try, and my first thought was to recreate my favourite T shirt. Once I'd cut it out, it only took a couple of hours of very leisurely sewing to complete. I followed the instruction diagrams exactly and the shoulder details slotted into place first time, it really was easy to sew. I sewed about 90% of it on my overlocker and finished all the bound edges and hems with a double needle. The pattern is multi-sized from 6 to 20 - I cut a size 12 at the bust, grading to a size 10 at the waist and hips. Looking at these photos I could probably have done with a bit more room across the bust, but it doesn't bother me. I personally like my T shirts to be quite tight fitting, so I'll be wearing the hell out of it. For fabric, I used a white jersey knit from UK Fabrics Online, which is described as heavyweight, but is actually quite a light weight for a summer T-shirt. At £3.99 a metre, the quality is quite basic, so my plan was to use it for a test garment to check the fit. Once I'd finished the top and tried it on however it looked fab, a tiny bit transparent maybe, but nothing a good T-shirt bra can't handle! For a more robust jersey, take a look at the Interlock knits from The Village Haberdashery. They're reasonably thick, so probably not high summer weight, but ideal for any other time of year. 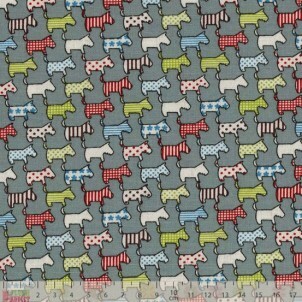 Admittedly I've made the plainest possible version of this pattern (sorry about that!) but it would also look lovely in a bright solid or patterned knit. You can add interest by using a contrast binding (see Zoe's gorgeous version here) or sew buttons on the shoulders. And there's a long sleeved option - yippee! I can really see this pattern becoming a wardrobe basic - I need a plain cream one … and a navy one …and maybe another white one…In short I love this top, it's easy to sew and looks ace - I plan to make hundreds of them. That's all! If you like the look of it too, the pattern is available to buy here. The Bronte pattern was given to me free of charge for review. All views my own. Exciting news today... Sally from Charity Shop Chic has launched a new range of PDF sewing patterns! I've followed Charity Shop Chic for a few years now and been constantly blown away by Sally's amazing refashioning skills; transforming ginormous men's shirts and sad looking grandma dresses into high fashion garments that look like they've just jumped off the pages of Vogue. She's finally put her impressive pattern drafting skills to good effect and created her first collection: Capital Chic Patterns. The difficulty levels of the patterns ranges from intermediate to advanced, perfect for those looking to move on from sewing beginner styles. Techniques such as using boning, French seams and machine-rolled hems are explained in detail, so they also offer a great way to improve your sewing repertoire. The six designs in the collection (two skirts, two dresses, one blouse and one sweatshirt) focus on work wear, cocktail wear and day-to-night looks and are inspired by the catwalk, red carpet fashion and London street style. Now I've got to be honest, my default mechanism for clothing inspiration is vintage rather than high fashion inspired. Plus, I don't require a work wardrobe, so a lot of the patterns don't really work for my personal lifestyle. BUT, the pattern designs have lovely clean lines (which I like) and excellent attention to detail (which I also like) and there's one pattern in particular that's taken my fancy - the Bellini blouse. Bellini is a loose fitting, cap sleeved blouse with either a cutaway or scalloped collar. It features bias-bound armholes, a machine rolled hem and French seams throughout. The thought of making a classic blouse with a beautiful finish really appeals to me. If I choose my fabric carefully (lightweight wovens are recommended) then I can see this being an ideal dressmaking project for autumn. I also have a gap in my wardrobe for smart tops to wear with jeans or slim trousers in the evening and I think Bellini fits the bill perfectly. I couldn't decide between the colour ways so bought both - maybe she'll get two skirts? Or a skirt and a cushion! I used linen-look cotton to make myself a sundress last year and I'm pleased to say it's been getting lots of use during the recent sunny weather. I'd definitely recommend it for summer dressmaking. If cute doggies are a step too far for you, Plush Addict also stock a good selection of classic patterns (polka dots, gingham and stripes!!) in their linen-look cotton range. As you'll know, if you've read this post, I've had plans to sew myself a pair of sailor shorts for a while. I have a LOT of striped tops in my wardrobe, all waiting patiently for some denim sailor shorts to turn up and be paired off with. Very patiently in fact - I haven't owned a pair of denim shorts since 1993…..
Obviously gigantic messenger bags were all the rage 20 years ago. Sadly I'm no longer the stick-thin 24 year old in the photo, but I wasn't going to let that stop me, I just used a pattern that was a bit more flattering to my shape. 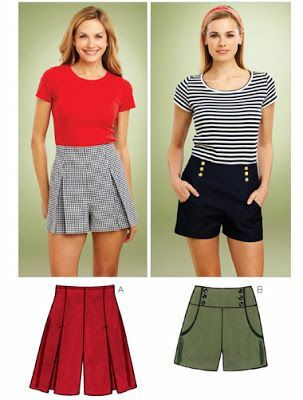 The pattern is Kwik Sew 3854 which comes with two options: mid-length sailor shorts (which I opted for) or a fancy looking shorts/culottes/skirt hybrid. This was my first time using a Kwik Sew pattern and I was mightily impressed with the well explained written instructions and clear diagrams. The pattern I used was kindly lent to me by Zoe, but Sewbox also stocks it here. I cut a size medium, which, according to the envelope, should have fitted perfectly, but they turned out much too loose, especially around the derriere. The denim I used has some stretch to it, but I suspect this pattern is sized quite generously anyway, stretch fabric or not. As usual, I couldn't be arsed to sew a muslin, so had to make all the fit adjustments on the go. To get them to fit the way I wanted them to, I removed a 1½" wedge from the top of the back crotch curve and ⅝" from the top of the front crotch curve. This means my waistband now has a centre back seam in it, like gents trousers! I also brought in the inside leg by ⅝", but left the side seams as they were as I didn't want to mess with the shape. I like the way sailor shorts or trousers are constructed: they have a central panel section/flap which folds open just above the pockets. When worn, the shorts are buttoned on each side of the waistband for a snug fit. You can't really get a sense of the exact fit until they're all buttoned up, so do as I say and not as I do - make a muslin first if you're at all worried about sizing! For buttons I used the same wooden anchor buttons from Textile Garden that Winnie used on her Nautical Coco. Aren't they amazing?! They come with little holes in them, so you can sew your own anchors in any colour of thread. My thanks to the reader who suggested they'd be a good match for my sailor shorts! It did take a little while to hand sew the anchors on six buttons, but I think the time invested was worth it. Sadly, my buttonholes are a bit of a mess, but that's the advantage of using gorgeous buttons - nobody will be looking at the buttonholes! I love these shorts! The fit is exactly what I was hoping for: comfortable and flattering but with a bit of a retro flavour to stop them looking too mumsy (I hope!) And as expected, they're a perfect match with my striped Coco. The Pink Suit by Nicole Mary Kelby first came to my attention via Karen, when she posted an excellent mini review prior to publication. Based on that review, the book went straight to the top of my wish list. My literary fairy godmother must have been hovering nearby though, because a few days later I was offered a review copy of the book by Virago. Joy of joys! I tried, I really, really tried to read the book slowly, but it was an impossible task. I read it in one day…. I'm sometimes asked to review novels 'about dressmaking' which, on further reading of the press releases, are nothing of the kind. The Pink Suit is different - it's all about dressmaking. It’s based on the true story of one of the seamstresses - Kate - who worked on Jacqueline Kennedy’s iconic pink suit. Yep, the very same one she was wearing when her husband was assassinated in Dallas. The Chanel-style suit was made at Chez Ninon - a Manhattan couture house providing select customers with 'line by line' Parisian knock offs. Buying from Chez Ninon allowed Jackie Kennedy to indulge her obsession with French fashion with a clear conscience - all her outfits were made in New York, so she was still seen to be supporting home grown businesses. As Kate's story unfolds, we really get a flavour of life in 1960’s New York. In Manhattan, we see the bustle and glamour of the Chez Ninon workroom and the colleagues she works with: the owners (known as 'the Ladies'), the in-house designer, the fitter and the finishers. In contrast to this are the everyday scenes with Kate's family and prospective sweetheart in Brooklyn. Pub singalongs and queues at the butcher’s shop are all part of the Irish catholic community in which Kate lives. I found these descriptions reminiscent of Colm Toibin’s wonderful novel - Brooklyn. Although Brooklyn was set in the 1950’s, in both books you get a strong sense of what it must have been like to be a young woman making a life for herself at that time. Kate’s personal story (will she or won't she marry the butcher?!) is pretty interesting as it stands, but for me, the whole business of making a suit for the First Lady just elevates it to a different level! When you're reading a book, do you ever feel that you want to savour the words as you read them? I sometimes feel it when I’m reading descriptions of food preparation (or perhaps that’s my natural greed?!) Anyway, I got that same feeling with The Pink Suit when I read the detailed passages about sewing, and in particular, couture sewing. Where do I start?! Did you know that couture sewing requires 20 stitches per inch at the beginning and end of seams, but only 12 per inch everywhere else? Or that everything is sewn twice: first with a straight stitch, then with a zigzag to reinforce the seam? No, I didn’t either, and it was fascinating. I read about beeswax on silk thread, hand quilted linings and discovered Jackie Kennedy's personal measurements and the adjustments her body shape required. I devoured every word of it and I learnt so much! 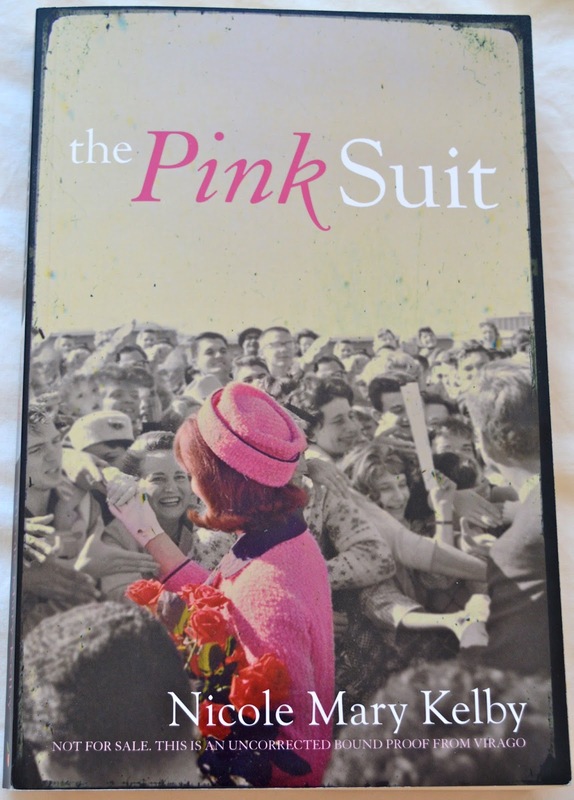 A copy of The Pink Suit was given to me free of charge for review. All views my own. I told you it wouldn't be long in the making didn't I?! This version of the Delphine skirt from Love at First Stitch was even easier to make than my first, largely because I cut out the correct size this time! I made a straight size 3, with a ½" seam allowance at the waist instead of ⅝" and that was it! The fit's really good. One thing I didn't mention in my first Delphine post was that I initially lengthened the skirt by two inches as it looked a bit short. Of course when I tried it on, it looked all wrong so I lopped two inches off the bottom, taking it back to its original length. My measuring must have been off however, (or maybe the size 4 is slightly longer? ), because I didn't alter the original length at all on this version and it's turned out shorter. So just for reference, the red denim version is probably just under one inch longer than the original pattern length. As per my last version, I added a standard dress zip rather than an invisible one, which will hopefully be more hard wearing. The waistband facing is made from the red shirting left over from my Afternoon Blouse, which is a lovely bright contrast against the Liberty Carline twill. Yes, you read that correctly, Liberty Carline twill!! 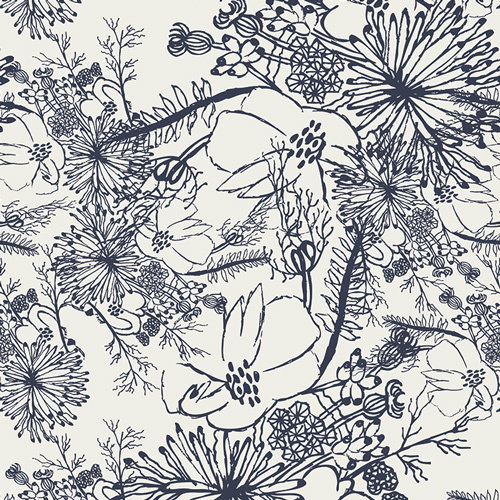 My favourite Liberty floral design - in TWILL! I didn't even know Liberty twill existed until last year when I made my blue rose shirt dress. 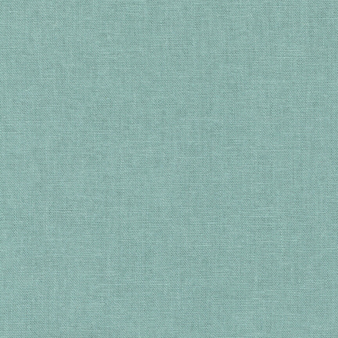 Reader Nathalie contacted me after seeing the post to say she had a metre of Carline twill going spare. It was left over from a project she'd finished and did I want it? YES!!!!! I screeched. That's one of the best things about having a blog - the friendships you make online. I've never met Nathalie - she doesn't even have a blog - but we've been emailing sporadically for a couple of years now thanks to our similar tastes in fabric! I'm so pleased that her leftover metre of Liberty twill has been turned into such a beaut of a skirt. 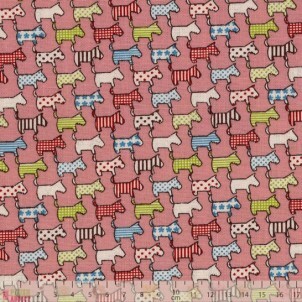 The Carline print is very busy, so I think it looks best teamed with a plain top half. The top I'm wearing isn't a particularly great match, but all my red tops were in the wash and it's the only plain cream top I own. Hmm, this might be just the kick up the arse I need to make a few neutral, short sleeved tops for summer. On the subject of summer dressmaking, I've almost finished two projects - my denim sailor shorts (talked about here) and a lemon print dress (inspiration here). They're both pretty awesome so it will be a big punch up to decide which one features on the blog first. I've been thinking a lot about summer dressmaking recently. There's something very satisfying about wearing beautiful, lightweight fabrics when the weather's warm (you may have to suspend your disbelief for that bit if you live in the UK!) With that in mind, I've teamed up with one of my sponsors - Dragonfly Fabrics - to talk you through their summer fabrics and offer suggestions on which patterns to pair them with. There's also a giveaway and discount code on offer - wahay! - so read on…. Dragonfly offer a very carefully curated selection, with an interesting range of colours and patterns. It's obvious that a great deal of thought goes into selecting the fabrics, but what really appeals to me is the fact that there are so many different types of dressmaking fabric available. How on earth do they decide which ones to stock?! My nosiness got the better of me, so I decided to ask Dorte (the fabric buying half of the Dragonfly Fabrics team) a few questions on the subject. 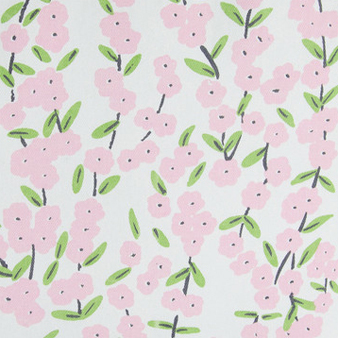 I love the fact that your fabric collection is so carefully chosen for dressmakers. How did you develop such a discerning eye? 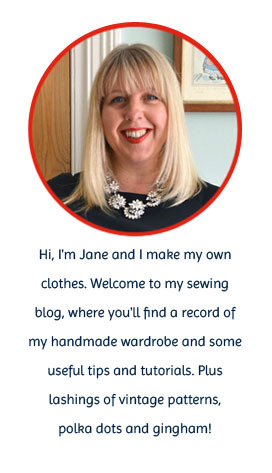 I started dressmaking when I was 10 years old. Over the years I have developed a love and feel for quality fabrics. This was enhanced by my time studying in Hamburg, where my studies included Fashion Design and Textile Technology, and by working with several Couture designers. With these designers I worked with quality fabrics where garments were finished to a very high standard. What's your criteria for deciding which specific fabrics to stock? Do you follow fashion trends or is it just personal taste? I am interested in colour, textiles and natural fibres, so yes I do start with personal taste. I then widen the range of colours and types of fabric we stock, I have developed a feel for what people like as I also teach sewing classes. The fabric producers we use, especially in Germany, are in touch with fashion trends, so these trends influence my choices, but I don't choose anything too extreme as I keep what my customers like in mind. Do you have any personal fabric and pattern recommendations for summer dressmaking? I think the Brussels Washer range, the Summer Cottons and the Rayon range are all particularly suitable for summer dressmaking. In terms of patterns, any of the rayon fabrics would work well with the Sew Liberated Brynna Dress pattern. 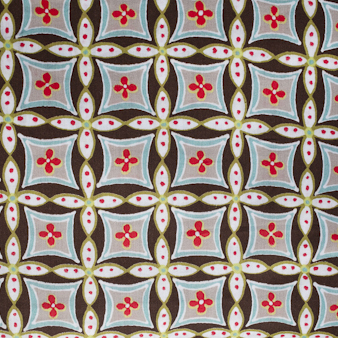 My favourite fabric and pattern choice would have to be the Christine Haynes Emery Dress using one of the fabrics from Leah Duncan's lovely collection. 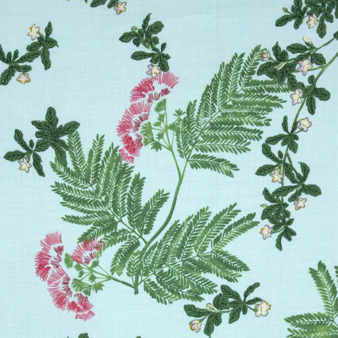 and this gorgeous Japanese blossom poplin for the By Hand London Flora dress. To kick off summer dressmaking, Dragonfly Fabrics are offering one lucky winner a £30 voucher to use in their online shop. To enter, just take a look at their website and leave a comment on this post letting me know what you'd spend the voucher on if you won (I told you I was nosy!) The giveaway is open internationally and closes at midnight GMT on Monday 9th June. Please make sure you leave your email address if it's not linked to your Blogger profile so I can contact you if you're the winner. And there's more…. 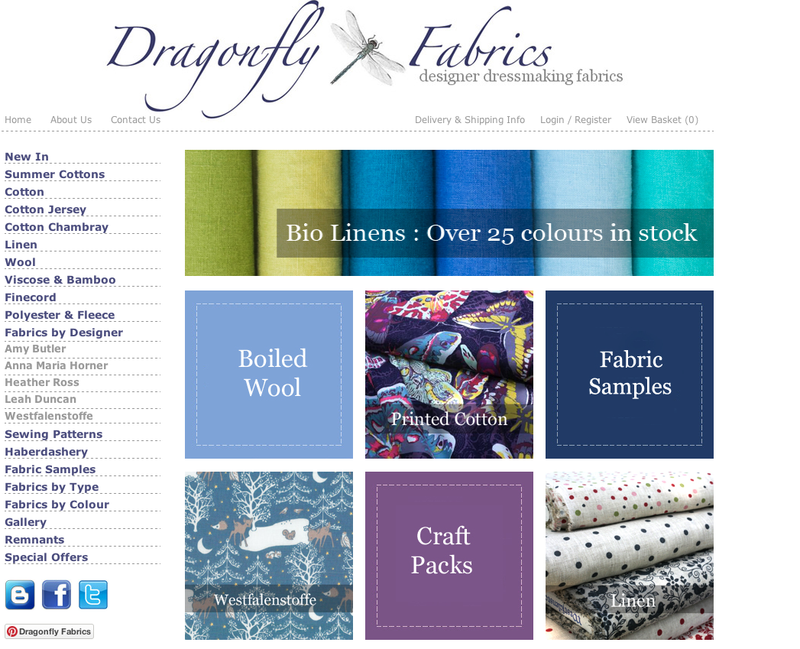 readers of my blog can also claim a 15% discount on all purchases from Dragonfly Fabrics. Just enter the code handmadejane when checking out of the site. The 15% discount is valid until the end of June.